It took me a long time to make up my mind and write this post. Because it addresses what is both the biggest motivator and also the hardest thing to come to terms with about this topic. Namely the embarrassment, stigma and misinformation attached to many behaviors associated with autism. I was particularly confused about the so-called “stims” and the fact that stimming, I thought, was one of the stereotypical behaviors exhibited by people on the autistic spectrum, although, ironically, it’s not exclusive to autistic people at all. At least not in terms of observable behavior. I had noticed, like everybody else, the flappy hands and spinning, but I wasn’t aware that there were other forms of stimming too. They also “seemed” to be of no use, and therefore extinguishing these behaviors seemed reasonable, even desirable! Ironically, I was convinced that I didn’t stim. Not at all, not ever. Well, I was in for yet another rude awakening! Having a daughter officially diagnosed and learning more about the condition, I slowly realized how clueless I was. It turns out there is lot more to stimming than that and stims are as diverse as autistic people are. Most importantly, stims play a much more complex role for autistic individuals than most people, including many with “experience” in the field, believe. As it turns out, this lack of self-awareness of stimming behaviors seems to be fairly common amongst late diagnosed individuals on the spectrum. It is a most common experience for people diagnosed as adults, as I have learned while sharing online with some wonderful people on several online support groups, most of all on facebook’s Asperger’s Life Support. There are several contributing factors to this phenomenon, that I can see in my own experience. Many of us have learned to suppress our stims due to fear of attracting unwanted, negative attention. I had a strong impulse to bite the insides of my mouth, sometimes causing bleeding (I know, not good.) My mother was on my case relentlessly trying to make me stop doing it for good. She would also try to make me stop my knees from doing their anxious, energetic and endless bouncing, and my feet from shaking. The funny thing is, after all these years, I still do all of the above and then some! I think what was achieved was more denial and subtleness in the behaviors than anything else. It certainly did not extinguish them! Once I started to connect the dots, I looked for more information about it. I was concerned that one of my stims was basically self-harming at times (the mouth thing). I also got exposed to the roles stims play for an autistic person and the whole controversy about ABA therapy, a modality of intervention based on Behaviorism, that keeps being marketed as a sort of the “one and only” option for autistic kids when in fact there are many other choices. Early on, stimming had been seen exclusively in a negative light, as a needless distraction or worse. In her own way and with the best intentions, my mother had tried her own versions of behavior modification of what I now recognize as my stims. Her mother (my grandmother) did likewise on occasion, although somewhat more successfully. My grandmother had been able to change some of my objectionable behaviors, particularly at the dining table, by offering more suitable alternatives in a firm but pragmatic way, appealing to the fact that her way was more “effective” or what not (she was right about that.) She pulled a clever trick there, appealing to logic! Smart lady! Soon enough I realized that my stimming was proportional to my level of stress and specially anxiety. In fact, they felt soothing and when aware of them, like something I would rather enjoy doing, except for the biting myself thing. I also realized that some of my other quirks were related to stimming. I would rarely go out at all, even to the convenience store down the block, without a “man bag” of some sort, prepped up with whatever fidgety thingies I was into at the time. I had been obsessed with pendulums for ages, for example, and space permitting, some pocket-book that I might even know by heart already, would find its way inside the bag. Not having some “fidgety thingies” and reading materials close by would make me feel rather anxious. Therefore, I ended up always carrying some sort of bag full of “junk,” with the obnoxious side effect of having to deal with relatives, etc., questioning the practice (and rolling their eyes) all the time. I was never able to let go of this practice, and at this point, I see no reason why I should. It became increasingly obvious that these behaviors also serve a positive function. They are very useful in lowering my levels of anxiety, for example. Incidentally, my daughters argue the same thing! Even more surprising, I realized that, frequently, my stims actually help me focus better, not the other way around! Realizing and accepting that I have always stimmed, and I always will, brings other questions to the table. Since stimming is here to stay, and the efforts at complete suppression not only fail but create other problems, insisting on completely vanquishing the behaviors is not a wise choice, I would say. But on the other hand, is approaching them from a more positive, proactive, manageable point of view, as I’m trying to do now, a realistic possibility? What to make of concerns about social appropriateness, embarrassment and shame? 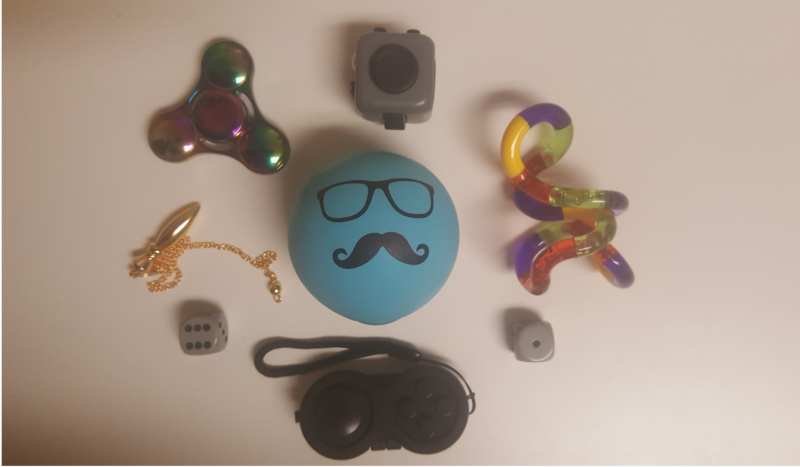 How should all that play out in my role as a father, as I see stimming behaviors in my own kids? One incident comes to mind. A few months ago, on a Friday night, my little one and me had an interesting interaction. We are observant Jews and part of the ritual at the table is to stand up for the blessing on the “wine” (grape juice). She has been super resistant to do so but also distressed by being the “one out”. She finally was able to discuss what bothered her about it. She thought that she had to remain completely still like her mother does and found it too hard. We told her that she could do like I frequently do and sway side by side, hold on to the table, etc. she by no means had to be “stiff”. She did nicely. I guess we exchanged “stimming tips” or something like that. It seems that, for me personally, and for us as a family, it is indeed possible to manage stimming in a gentle and pragmatic way. I’m learning and experimenting as I go, but the one thing I want to overcome of first and foremost is feeling ashamed for stimming! This is a great read about why stimming is important for autistic people, and not something we should be required to suppress just to make other people more comfortable. I look forward to more enlightening articles! Thanks for your feedback! I feel that there is much more to say about this particular topic. Stay tuned!